Herman Cain: Blacks Have Been "Brainwashed"
"Strong word", but Mr. Cain is not afraid to speak what he's thinking. Thank you Noel Sheppard for doing this research, which exposes Obama's taxation fabrication being propagated by his MSM minions. The "Buffett Rule" is horse excrement. Today, President Obama finally announced his plan for deficit reduction. As should surprise no one, his solution is to raise taxes. Not just to raise taxes, but specifically on the "rich". He targets "millionaires" (those individuals making over $200,000), who have not been paying their fair share (the top 5% of wage earners in this country pay 60% of total taxes). Of course, we know in reality this "plan" will hit just about everyone, not just those falling into Obama's "millionaire" target. When liberals get tax-happy, watch out, because they'll slap a tax or a fee on just about anything that moves, or even if it doesn't. Obama stated today that he would veto anything that came to his desk, that did not have serious revenue increases. Every time you hear the word "revenue" from the mouth of a liberal politician, that's code for tax increase on the rich. We all know that. But I started to contrast his stated goals (increased revenue), with the name for his plan (Buffett). Of course, Buffett, refers to Warren Buffett, who has famously advocated for tax increases on the "rich", demonstrating alleged "unfairness", with the example that he pays a lower tax rate than his secretary pays. Without getting in too deep into the inherent fallacies of his comparison, I will tell you that it reminded me of the only way to increase Warren Buffett's taxes on income. To do that, the federal government MUST increase the capital gains tax, which currently stands at 15%. Economists have clearly demonstrated that increases in the capital gains tax rates actually DECREASE revenue. There is little debate about this, and it was recently demonstrated in the 1980's, when increase of the cap gains rate to 28% caused a decrease in total revenue (see Paul Ryan's recent quote, "if you tax something more, you get less of it"). Don't forget that Obama just vowed to veto any legislation without "serious revenue" increases. If we know that an increase in the marginal rate lowers revenue, then does that mean Obama is vowing to veto legislation with marginal rate increases? Doubtful, but don't think Obama doesn't know the revenue impact of raising rates. He knows full well, but he just doesn't care. Below is an excerpt from a 2008 interview with Charlie Gibson (courtesy of DistributedRepublic.net). MR. GIBSON: And in each instance, when the rate dropped, revenues from the tax increased. The government took in more money. And in the 1980s, when the tax was increased to 28 percent, the revenues went down. So why raise it at all, especially given the fact that 100 million people in this country own stock and would be affected? MR. GIBSON: But history shows that when you drop the capital gains tax, the revenues go up. SENATOR OBAMA: Well, that might happen or it might not. It depends on what's happening on Wall Street and how business is going. What this all boils down to, is more redistribution, and more tax policy to dictate "fairness", as determined by Barack Obama. Once you see through the smoke and mirrors, this has nothing to do with deficit reduction or creating jobs, or turning the economy around. It's just the same old liberalism. "if you love me, you gotta help me pass this bill"
This fits perfectly with Sarah Palin's brilliant, recent indictment of "Crony Capitalism". Glitch in Obamacare legislation gives states increased power to send this disaster back to Washington! I wanted to report myself as a gag, but apparently Michelle Malkin beat me to it. You can also hashtag any of your tweets with #attackwatch to report your neighbors via twitter. Social Security has been known to be a Ponzi scheme for years. We keep hearing from Chris Matthews (MSNBC) and countless other media and politicians that the anthropogenic climate change debate is over and the science is settled. I've even recently heard Republican presidential contenders described as "not believing in science", if they haven't accepted human caused global warming as scientific fact. Here is a cold, hard FACT: there's still plenty of debate in this area. Rick Perry was correct in stating that there are plenty of scientists out there who dispute the theories of those scientists saying that global warming is man caused. He is also absolutely right in stating that we shouldn't be making massive government-mandated, economy-destroying regulations based on this disputed theory. Yes, Governor Perry had trouble articulating this (I've actually volunteered to the campaign to help debate-prep him on this issue, but they have not yet responded), and he had trouble coming up with a name of a climate scientist who helps to shape his view on this issue. Hint: Roy Spencer, PhD is one name Governor Perry should be espousing. Linked below are two articles disputing the theories, of whether or not clouds cause temperature changes (e.g. warming). One theory is from a scientist at my beloved alma mater, Texas A&M University, stating that clouds do NOT cause warming. Another is from Dr. Spencer, punching holes in that theory, with his own theory. This, my friends, is scientific debate, over two conflicting theories, on a topic in which there is little real understanding in the scientific community.....hence the reason that we should not be making government regulations at this time in history, based on one of the unproven theories. THE SCIENCE IS NOWHERE NEAR 'SETTLED'. Romney is not only defending RomneyCare and the individual mandate, but he is sounding like the worse of the left-wing fear-mongers in defending the existing Social Security system which the Social Security trustees say is unsustainable. This is why I do not believe Romney can be relied on to roll back the massive federal Leviathan. He believes in it. Just as Paul Ryan came up with reforms to Medicare and Medicaid, Rick Perry -- who I have not endorsed, as I am not endorsing anyone right now -- is urging reforming Social Security. But now we have Romney acting like a liberal demagogue, seeking political opportunity by scaring seniors and lying about the program. I notice he has not been all that critical of Perry's poor record on illegal immigration. Why is that? Is Romney weak on illegal immigration as well? Apparently Romney's Social Security fear-mongering has earned him Tim Pawlenty's useless endorsement, meaning we were right to be skeptical about Pawlenty's claim to be a fiscal conservative. And my good friend Michele Bachmann is walking a fine line, jumping on this Social Security issue in hopes of attracting support from seniors in Florida. These Republicans need to understand that this is not the 1970's. We, the people, are demanding the truth about government and we are demanding real changes. We know that the entitlement programs are unfunded to the tune of over $60 trillion. And we are demanding that this be addressed. Romney has no plan for addressing any of it, that much is clear. I remember so vividly, this morning, 10 years ago. I was working from home that morning, after taking my 6-year old daughter to school, since my wife was ill. The phone rang, and it was my wife's friend, telling us the news. Emotions fluctuated from fear to rage, from love to patriotism, from sorrow to thoughts of vengeance. The intensity of those moments pushed my wife's illness to the background, as we considered whether we should go pick our daughter up from school. We knew that what had occurred was a turning point in history, and that things would never be the same. When we decided to leave her at school until dismissal, we pondered how we would possibly explain this unprovoked attack on innocents in our nation. All day we watched the events unfold on television, in continued amazement. Our daughter now understood that evil men from the other side of the world had violently attacked us in the name of their god. We all began to understand about an organization called al Qaeda, and a terrible man named Osama Bin Laden. The faces of Mohammed Atta, and others became burned into our minds, along with, of course, the horrifying images of the aftermath in New York, Washington, and Shanksville. As we learned about the heroic efforts of men and women in NYC, and in the skies over Shanksville, we felt hope. 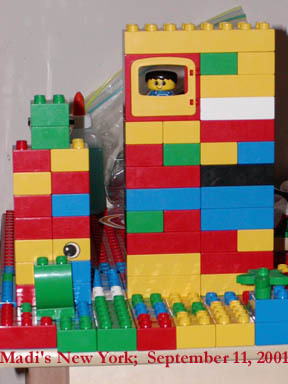 That evening, our daughter called us into the hallway, where she had been playing with her Lego table. She proudly announced to her mom and me, that she had "rebuilt the towers" for New York. We instantly knew that even at 6 years old, she understood the gravity of this event. We have been through so much since that time. It brought us all closer together, nationally, as well as at home. It helped us as a nation, and personally, to appreciate our lives, and also to understand the fragility of our fortune, and the importance of vigilant protection of our precious families, and our precious freedom. Today, my beautiful daughter is sixteen, and my precious wife has gone home to join our Lord in Heaven. So much has changed in these 10 years, but I pray we never forget. I don't know why I was surprised to see Owebama propose almost half a trillion dollars in new stimulus spending in his "American Jobs Bill" speech Thursday night. What a joke this guy has become. He is actually a caricature of himself now, and when you think he can't get any worse, he give a speech like Thursday's. Owebama proposed $450,000,000,000 in new spending Thursday night. The 2010 census estimates there are about 112,000,000 households in the United States. $450,000,000,000/112,000,000 = $4,017.86 PER HOUSEHOLD. Over $4,000 per household! Are you kidding me?!? Granted, this pales in comparison to his last failed attempt to fix the economy with the same ridiculous strategy, but seriously, this guy needs to have his head examined. We all know this will never pass, thanks to the House of Representatives, and we also should be certain that Owebama knows this too. He has to be just proposing something absurd, knowing the Republicans will reject it, and he can start up the cries of partisanship, gridlock, and the "party of no", in preparation for his reelection bid. We know the media won't hold him accountable. Hell, they're editing transcripts of his speeches, in order to try and keep him from looking stupid. A Ponzi scheme is a fraudulent investment operation that pays returns to separate investors, not from any actual profit earned by the organization, but from their own money or money paid by subsequent investors. The Ponzi scheme usually entices new investors by offering returns other investments cannot guarantee, in the form of short-term returns that are either abnormally high or unusually consistent. The perpetuation of the returns that a Ponzi scheme advertises and pays requires an ever-increasing flow of money from investors to keep the scheme going. The system is destined to collapse because the earnings, if any, are less than the payments to investors. It's not hard to draw parallels between this definition, and a government sanctioned scheme that relies on today's contributions (from future beneficiaries) to pay today's beneficiaries, who invested years ago, into a program that is destined for collapse. For Mitt Romney, or any other GOP candidate to try to cast Rick Perry as a guy who wants to "abolish social security" is nothing but a tactic to scare today's seniors, and is despicable. "The budget should be balanced, the Treasury should be refilled, public debt should be reduced, the arrogance of officialdom should be tempered and controlled, and the assistance to foreign lands should be curtailed lest Rome become bankrupt. People must again learn to work, instead of living on public assistance." --Cicero, 55 B.C.